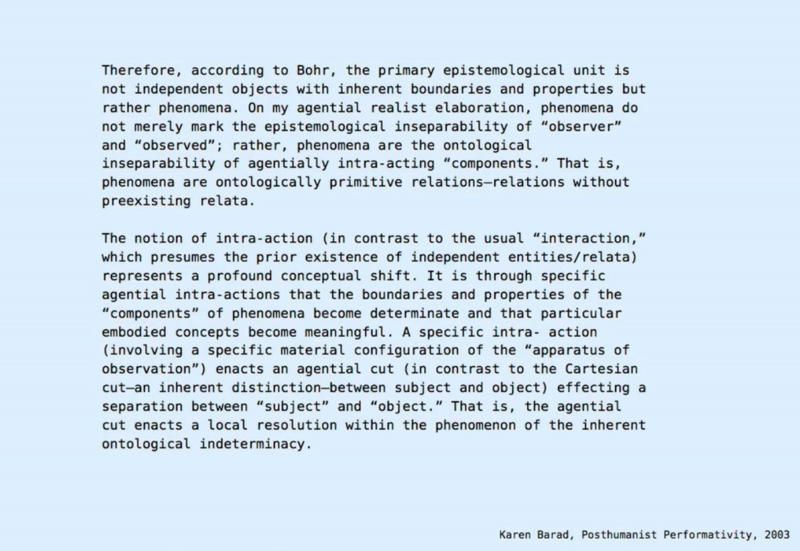 Therefore, according to Bohr, the primary epistemological unit is not independent objects with inherent boundaries and properties but rather phenomena. On my agential realist elaboration, phenomena do not merely mark the epistemological inseparability of “observer” and “observed”; rather, phenomena are the ontological inseparability of agentially intra-acting “components.” That is, phenomena are ontologically primitive relations—relations without preexisting relata. The notion of intra-action (in contrast to the usual “interaction,” which presumes the prior existence of independent entities/relata) represents a profound conceptual shift. It is through specific agential intra-actions that the boundaries and properties of the “components” of phenomena become determinate and that particular embodied concepts become meaningful. A specific intra-action (involving a specific material configuration of the “apparatus of observation”) enacts an agential cut (in contrast to the Cartesian cut — an inherent distinction—between subject and object) effecting a separation between “subject” and “object.” That is, the agential cut enacts a local resolution within the phenomenon of the inherent ontological indeterminacy.